The man who saved his wife, daughter and 30 other strangers from an armed robber, was shot and later arrested by police—even though he complied and put his hands in the air as soon as they arrived. Independence, Missouri – The man who should be celebrated as a hero for saving his wife, daughter, and at least 30 strangers from an armed gunman during an attempted robbery, is now recovering from a gunshot wound after police arrived at the scene and shot him. 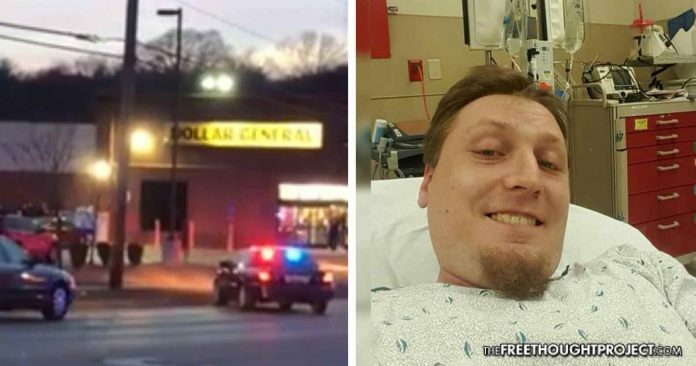 Mike Becker, 31, told the Kansas City Star that he grabbed his handgun and rushed to the local Dollar General after he received a call from his wife saying that she, their 4-year-old daughter, and several other customers in the store were being threatened by a man with a gun. While the customers huddled together in the back of the store, Becker’s wife hid their daughter behind bags of dog food. When Becker arrived, he said he found the gunman outside, pounding on the glass door. When police officers finally arrived at the scene, Becker told the Star that he dropped his gun and raised his hands in the air, in an attempt to show police that he was not a threat. But then the unthinkable happened—even though Becker had his hands in the air, the officers shot him with a rifle, wounding his hip. Bystanders who witnessed the scene said that they were shocked to watch officers shoot the man who was brave enough to confront the gunman. “I was figuring, ‘How the hell do they shoot him?’ He never pointed a gun at the cops. He complied with everything they said … and then you heard a pop,” Raymond Watts told the Star. Police eventually arrested the gunman, but despite the fact that witnesses claimed they were yelling at officers and telling them that they shot an innocent man, the officers still proceeded to put Becker in handcuffs, and they refused to let his wife near him. The statement did say that while no officers were injured, “two subjects were shot” and they were both “transported to area hospitals with injuries.” However, the statement also claimed that both of the men who were shot by police were armed. It failed to admit that one of those men dropped his firearm on the ground and raised his armed in surrender before he was shot by police. Another witness to the shooting, Whitney Thomas, also told the Kansas City Star that Becker’s gun was clearly on the ground at the time police opened fire. “His gun was on the ground. He didn’t have it in his hands any longer,” she said. Thomas was inside the store at the time the gunman arrived, and she said that she heard a Dollar General employee on the phone, telling a police dispatcher that the suspect was slender, wearing a green jacket, and looked to be in his 50s. However, Becker is 20 years younger, heavyset and he was wearing a black jacket. Thomas said this led her to question why police would shoot a man who was not only not posing a threat to anyone, but who also did not match the description of their suspect. “I understand as police you have to put your life on the line … but to take it into your own judgment to shoot an innocent man when he didn’t fit the description?” Thomas said. Becker, who is still suffering from the injuries he sustained during the shooting, told the Star that police have been “extremely tight-lipped” about the incident, causing rumors to spread in the town that HE was the one who initiated the robbery. While it remains to be seen whether the officers responsible for the shooting will be held accountable for their reckless actions, it should be noted that this is not the first time such an incident has occurred. As The Free Thought Project has reported, in one case, a woman in Eufaula, Oklahoma, was shot nine times by police, while she was being held hostage during a bank robbery. *This story was updated to correct the location of the shooting.